As they dig their trenches to try to withstand what may (or may not be) a Democratic wave, Republicans may take heart in the performance of their current incumbents last year as a buffer against a potentially challenging environment next year. Very few of the Republicans' 241 House victories last year were small. Just 15 districts featured a GOP win in the single digits, meaning that 226 House Republicans had margins of victory of 10 points or more. So in order to capture a majority, Democrats must win several districts that most recently delivered decisive wins to the GOP. However, the results from the last election may not actually be all that meaningful because House performance can vary greatly from one election to the next, particularly if there is a wave-style environment. The last three midterms are illustrative in this regard. During the 2006, 2010, and 2014 midterms -- all of which featured decisive House victories for the non-presidential party, which is relatively common in midterms -- we looked at how the two-party vote shares for candidates from the president's party changed from the preceding presidential year to the midterm. In other words, we looked at the Republican two-party vote share in 2006 compared to 2004 (under Republican President George W. Bush), and the Democratic vote share in 2010 compared to 2008 and in 2014 compared to 2012 (under Democratic President Barack Obama). Over those three midterms, about 1,000 races -- 1,001 to be precise -- satisfied the requirements for inclusion in this study. We used a compilation of two-party U.S. House results from Gary Jacobson, the distinguished University of California, San Diego political scientist. On average, the presidential party's share of the two-party vote declined by 5.3 percentage points in these three midterms from the previous cycle's results. And, since we're just taking into account the two-party vote, the actual average change in margin is double that, because when the president's party share declines, the non-president's party share grows by that same number. So the average reduction in the presidential party margin in these thousand House races was actually 10.6 points. That kind of change turns a 55%-45% win for a House candidate from the president's party into roughly a 50%-50% coin flip. The median was a little bit lower than that, about a 9.2-point decline in margin. Of the 1,001 races we looked at, the president's party share fell by at least some amount in close to nine of 10 of all the races, 874 total (or 87%). So the presidential party margin grew from the presidential election to the midterm in more than a tenth of these races despite the overall trend against that party. The reasons for these exceptions often included an underperformance by a weakened member of the non-presidential party; a new member from the presidential party elected in a presidential year building an incumbency advantage in a midterm reelection bid; or other factors. But generally speaking, the presidential party experienced an erosion in performance in the lion's share of House districts from the presidential to the midterm year. The declines varied by cycle, with the president's party seeing their biggest average vote share losses in 2010 (7.5 points, or about 15 marginal points), with smaller but still sizable decreases coming in 2006 (4.6 points, or 9.2 marginal points) and 2014 (3.5 points, or about seven marginal points). Part of that probably had to do with the comparison to the previous presidential year House results. In both 2004 and 2012, the national House popular vote was fairly close -- Republicans won it by 2.6 points in 2004 and Democrats by 1.4 points in 2012 -- before the other party carried the national popular vote by a larger margin in the subsequent midterm -- Democrats by 6.4 points in 2006, Republicans by 5.1 points in 2014. Meanwhile, Democrats won the national House vote by 10.6 points in 2008, which shifted to a 6.6-point Republican edge just two years later, contributing to the huge average Democratic vote share losses in 2010. But these specific yearly averages reinforce a larger trend, which is that the president's party often struggles in midterm House elections. The president's party has lost ground in the House in 36 of the 39 midterms since the Civil War, and the average seat loss is 33. Democrats netted 31 seats in 2006 during George W. Bush's second midterm, and Republicans netted 63 and 13 seats, respectively, in 2010 and 2014 during Barack Obama's two midterms. The GOP gain in 2014 was relatively small in large part because the party already held 234 seats going into that midterm, and their 13-seat net gain gave them their biggest majority (247) since before the Great Depression. The presidential midterm problem compounds whenever the president's approval rating is underwater 1: Bush's was -16 (39% approve/55% disapprove) in the RealClearPolitics average on Election Day 2006, and Obama's was 2 -3 (46%/49%) in 2010 and -11 (42%/53%) in 2014. Right now, President Trump is at 3 -16 (40%/56%), and Democrats hold a seven-point lead in the RealClearPolitics national House generic ballot polling. So the threat to the Republican House majority is clear, even though of course those numbers have plenty of time to change. But who does the threat loom largest against? And what kinds of seats might be in play? Here's where going a little deeper into the vote share changes from the last three midterms may be helpful. Remember, even in big wave years, most House races are not all that competitive. 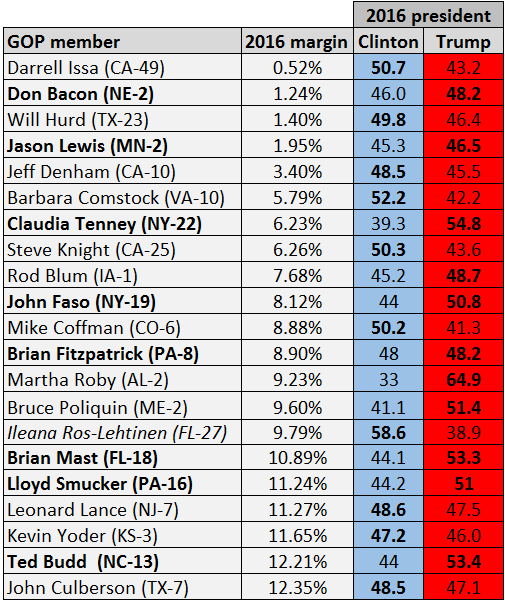 While there are all sorts of ways to measure competitiveness, House race ratings (done by the Crystal Ball or other handicappers) is one way to assess the districts that both sides saw as at least somewhat close and contested going into the election. These are the districts that are likely seeing the most competitive campaigns and the most outside spending. Of the 1,001 races we studied over the three midterms, 238 were rated in competitive categories by the Crystal Ball in those years' final House rankings. These were the races that were rated as Toss-up, Leaning, or Likely. The remaining contests were rated as Safe for the incumbent party. Perhaps unsurprisingly, the average drop in two-party vote share for the presidential party in the competitive races was greater than that in the ones that were not rated. For the competitive contests, the average vote share for the presidential party dropped eight points over the three midterms. And, let's recall that we should double the eight points to fully account for the margin. So a competitively rated seat that provided the presidential party with a seemingly gaudy 58%-42% win in the previous presidential election would, on average, become basically a 50%-50% race. Safe seats, meanwhile, did not see as big of a drop, with a presidential party vote share drop of a little more than half of the rated seats, 4.5 points. This makes sense -- rated races are ones likely to feature the strongest challengers, the most outside spending by both parties, and the most engaged electorates. Rated races may include many open seats, too. As we'll show below, whether a seat is open or features an incumbent is a very important factor. Individual races often deviated far from this average. In the whole dataset, the biggest drop for the presidential party came in NE-3 from 2004 to 2006. In 2004, then-Rep. Tom Osborne (R), the former Nebraska football coaching legend, was romping to reelection, and he captured about 91% of the two-party vote. The following cycle, Osborne lost a very competitive Republican gubernatorial primary to Dave Heineman, who would go on to serve two terms as governor. Now-Rep. Adrian Smith (R, NE-3) captured the open seat, but he only won 55% of the two-party vote in the heavily Republican, rural district. The race seemed so competitive that then-President George W. Bush, who had won three-quarters of the vote in the district just two years prior, campaigned for Smith in the district just days before the election. Seemingly secure ground held by the presidential party can become very insecure in a wave, particularly when there's an open seat. We divided up the House races from the three midterms we studied into four categories: Seats that featured an incumbent from the presidential party; seats featuring an incumbent from the non-presidential party; open seats defended by the presidential party; and open seats defended by the party that didn't hold the White House. The seats featuring incumbents from both the presidential and non-presidential party changed in similar ways. On average, the vote share for the party that did not hold the White House grew by 4.4 points in seats where it had an incumbent running for reelection, while the non-presidential party's vote share rose six points in seats where an incumbent from the presidential party was running. If this pattern repeats in 2018 -- again, a very big if at such an early point in the cycle -- one would expect Democratic incumbents who won very close races in 2016, like Reps. Ami Bera (D, CA-7) and Rick Nolan (D, MN-8), to be able to improve their vote share in 2018 simply by virtue of the typical bonus that the non-presidential party receives. Indeed, of 408 races that met the requirements for inclusion in this study featuring incumbents who were not members of the president's party, 405 won reelection in the midterm. The three exceptions were: Reps. Lee Terry (R, NE-2) and Steve Southerland (R, FL-2), both of whom had significant, self-inflicted political damage and lost to Democratic challengers in 2014, the least “wavy” of the three elections studied, and Rep. Charles Djou (R, HI-1), who won a fluky special election in May 2010 thanks to a Democratic split in the all-party election for the seat. Djou then lost the seat in the regular general election later that year. Note: First-term members are in bold, retiring members are in italics. Source: Vote by congressional district from Daily Kos Elections 7 4. 2016 victory margins from the Cook Political Report 8 5. Perhaps more interesting, though, is what happened in open seats in the last three midterms. Granted, the sample sizes here are not that large -- the presidential party defended 46 open seats that qualified for our list over the last three midterms, while the party that did not hold the White House defended 48 -- but the difference in presidential party performance between the two is eye-popping, if not necessarily surprising. In the open seats defended by the party that did not hold the White House, there was essentially no change in performance on average -- the average change from presidential to midterm was a tiny .02 points in favor of the president's party -- meaning that the party that did not hold the White House typically paid little penalty for not having an incumbent in these seats. In fact, the non-presidential party only lost one of these 48 races over the three midterms: Delaware's at-large seat, which now-Gov. John Carney (D) captured from the Republicans in 2010 thanks to popular then-Rep. Mike Castle's (R) decision to run for Senate (he lost the primary in a surprising upset to Christine O'Donnell, which almost assuredly cost Republicans a Senate seat that year in addition to losing Delaware's lone House seat). Conversely, the results in open seats defended by the presidential party saw huge swings in favor of the opposite party. In such seats, the presidential party share declined about 11 points from the presidential to the midterm elections -- or 22 points in terms of margin -- and the president's party only held 25 of the 46 seats included in the study over the three midterms. It was very rare for the president's party to improve on the previous incumbent's performance from the presidential to the midterm: The only midterm winner who did so in a significant way was now-Rep. Seth Moulton (D, MA-6), who defeated scandal-tinged Rep. John Tierney (D) in a 2014 primary and then markedly improved on Tierney's narrow 2012 reelection margin. So typically, though not always, seats held by incumbents are easier to defend. The results for open seats not held by the presidential party suggests that Democrats would have roughly even odds to hold their two most vulnerable open seats, NV-3 and MN-1, two districts President Trump won and that the outgoing Democratic incumbents only carried by about a point apiece. If a Democrat were in the White House, these seats probably would be easy pickups for Republicans, given the historical record. There is not an enormous number of Republican open seats right now, and there's only one that is both an open seat and that has an incumbent who won a relatively weak victory in 2016: FL-27, held by outgoing Rep. Ileana Ros-Lehtinen (R). Ros-Lehtinen holds the most Democratic seat held by any Republican -- Hillary Clinton carried it by 20 points last year -- and she only won by a little less than 10 points. Recreating the average open seat performance by the presidential “out” party would flip FL-27 from a 10-point GOP win to a 12-point Democratic win. This should be an easy Democratic pickup in the event of a good Democratic environment even though Republicans are typically strong down-ballot in South Florida. A Republican hold in this district would be an utter disaster for Democrats and probably would be suggestive of a midterm where Republicans performed quite well by historical standards. But beyond FL-27, the other seven current GOP open seats do not look like particularly attractive Democratic targets. Even including Ros-Lehtinen, the average GOP two-party vote margin of victory in these open seats was about 30 points. That's stronger than the average 22-point loss in margin the presidential party has lost in open seats going from the presidential to the midterm, although there are several instances (all from the 2006 and 2010 waves) of the presidential party margin falling 30 points or more in open seats. Still, it may be that one or more of these seats will become a Democratic target next year. One longshot possibility may be TX-3, held by retiring Rep. Sam Johnson (R). The suburban Dallas seat is still very Republican, but Hillary Clinton cut Barack Obama's 30-point loss there in 2012 in half, losing by 14 points -- the district featured one of the biggest swings toward Clinton 6 of any GOP-held seat in the country. And Johnson's 28-point margin of victory suddenly doesn't seem so impressive when one considers the huge drops in performance the president's party sometimes suffers in open, midterm defenses. Source: Vote by congressional district from Daily Kos Elections 7 4. 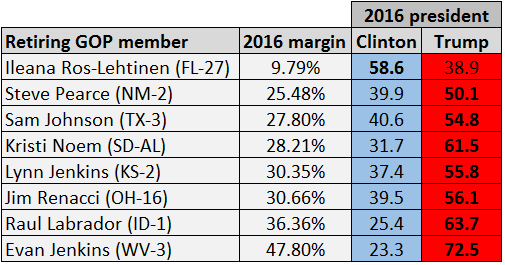 2016 victory margins from the Cook Political Report 8 5. Special election results from official sources. We do already have a few examples of what's happened in GOP-held open House seats in the Trump era. There have been four special elections in these seats -- KS-4, MT-AL, SC-5, and GA-6. Republicans held all of these seats, but with significantly reduced margins from what the incumbents did last November. On average, the four former incumbents won by 23.7 points in the two-party vote margin in 2016. This year, the special election winners won by 4.7 points in the same measure, a drop of 19 points, very similar to the presidential party average loss of margin in the last three midterms in open seats (22 points). So perhaps the overall message from this analysis is to watch, in particular, the GOP-held open seats, and how many more emerge over the next year. There will be more retirements, and they could make seats that were not very competitive in 2016 very competitive in 2018. Depending on how many there are, these retirements could be a major factor in determining which party controls the House in 2019. Beyond that, GOP incumbents who run again next year should heed the old cliché: run unopposed, or run scared. Their previous big wins may not protect them in the event of an anti-Republican environment next year. And for the Democrats, historical averages may be tantalizing but they provide no guarantees of easy victory, or victory at all. There will be a titanic struggle for each and every seat that is even marginally competitive. 1. Here's how we decided which races to include: For each of the three presidential-to-midterm comparisons, any district that was uncontested by one of the two major parties in either election was excluded. We also excluded elections in states that use a “top-two” system (California and Washington) in which two members of the same party advanced to the November election. Districts that were redistricted between the presidential election and the midterm were also discarded, meaning that all of Georgia's results and a handful of Texas districts are excluded from the 2004-2006 analysis because those states used different maps in those two elections. Finally, we did not include any results from Louisiana because of its unique, November “jungle” primary system that sometimes produces December runoffs. Understandably, this culled hundreds of races from our three-midterm study, but we still ended up with 1,001 total races over three time periods: 316 in 2004-2006, 357 in 2008-2010, and 328 in 2012-2014. 2. Our decision to exclude Louisiana from our study removes one of the rare losses for a non-presidential party incumbent in a recent midterm. In 2008, Joseph Cao (R) narrowly defeated indicted Rep. William Jefferson (D) in a heavily Democratic seat based in New Orleans. Two years later, Cao won only a third of the vote against now-Rep. Cedric Richmond (D, LA-2). 3. Even though the seat is currently open, we did not include UT-3 on this list of open seats. That's because the seat, previously held by former Rep. Jason Chaffetz (R), will be filled later this year in a special election, and we're assuming the winner of that special election will be on the ballot next November. Of course, it's possible that the special election winner will not be renominated next year, but that seems very unlikely. Also not included is Rep. Mo Brooks (R, AL-5), who is running in a special election for Alabama's vacant U.S. Senate seat. If Brooks doesn't win the Senate seat, he could still run for reelection to the House in 2018, so we're not counting his seat as open at the moment.